It’s no surprise that I love pastured eggs, in all ways. To keep them as healthy as possible though, we usually prepare them in the sous vide under low temperature (by far the easiest), poached on the stove, or maybe gently scrambled using the double boiler method. My preferred experience is to have more yolks than whites and I want my yolks runny. 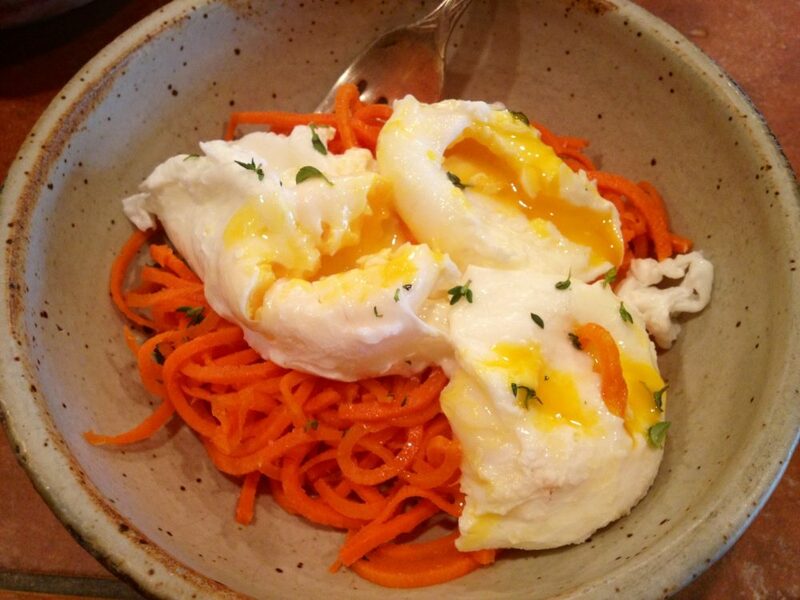 In my quest to present foods in a variety of ways with different vegetables for my family, I’m featuring a fun and delicious recipe for poached eggs that are sitting atop a nest of spiralized organic carrots, drizzled with a bit of melted grass fed organic butter, and sprinkled with fresh thyme (one of my favorite herbs). I was inspired for this recipe by the Food Lovers Kitchen. Poaching eggs is pretty easy but it took me a couple of tries, doing different things to get it where I like it. What I’ve ended up with is that I use a large and deep Le Cruset skillet so I can make 4 to 6 poached eggs at a time, with about 6-8 cups of simmering water, a splash of apple cider vinegar, a careful eye, and timing of about 3 1/2 to 4 minutes. (More details below). Spiralize your carrot and cook it in a couple tablespoons of water, over medium heat and covered, until tender. Transfer to serving bowls and season with some sea salt. 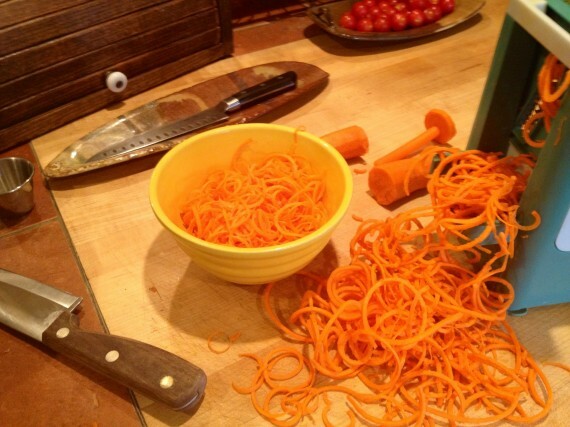 Using mom’s turning slicer to spiralize organic carrots. Kamea loves these. While you’re cooking the carrots, have your water warming up on the stove in preparation of poaching the eggs. I like to put the eggs, ready to be poached, in separate little cups so I can quickly drop each one in, one right after the other. Le Cruset deep skillet with eggs lined up individually, ready to be dropped into simmering water. Have a plate lined with paper towel and a slotted spoon ready for when it’s time to retrieve the eggs from the pot. 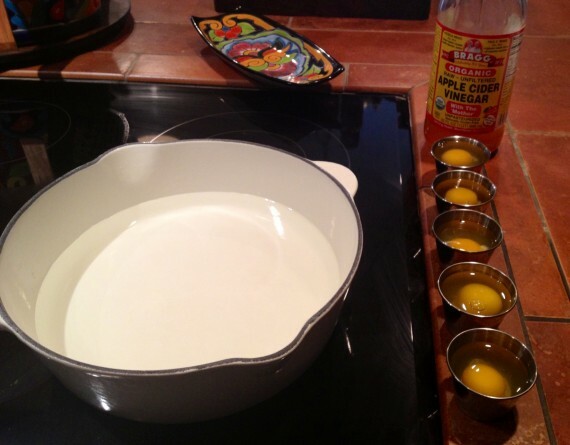 Add a splash of apple cider vinegar to the water for the eggs. The topic of adding vinegar while poaching eggs is debated. I used it in this recipe but I might not going forward… my jury is still out on it. Once the water is simmering, gently drop each pastured egg into the pan (or pot). Set the timer and let them cook for 3 to 4 minutes (if you like your eggs like I do, with a runny yolk). You’ll notice that I don’t “vortex” the water. This is for two reasons… 1) I’m cooking multiple eggs at once and I’m not sure how that would help. It’d probably be a problem, and 2) I actually don’t try to keep all of the egg white in tact as I don’t mind if some of the white from each egg drifts off. I don’t mind because when I eat eggs I’m really after more yolk than egg white. If you’re not gentle when transferring the eggs, they can break like one of mine did. Sigh. 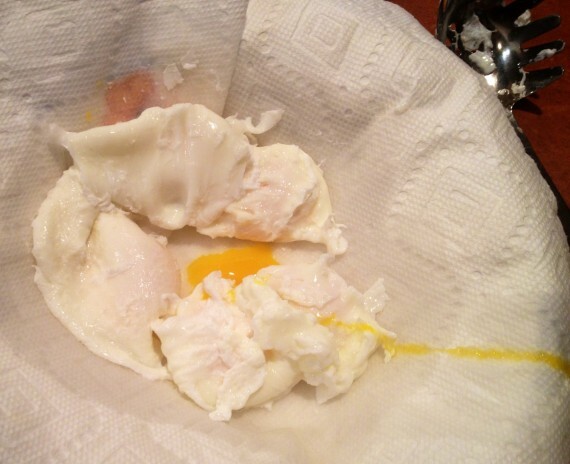 Take each egg out gently and place it on the plate with the paper towel. Once some of the water has absorbed off the egg and onto the paper towel, place the eggs on top of the carrot nests. Drizzle with melted grass fed butter (or coconut oil if you’re paleo), and sprinkle with sea salt and fresh herbs. Each egg broken open so the yolk can run over the nested carrots. Perfection. 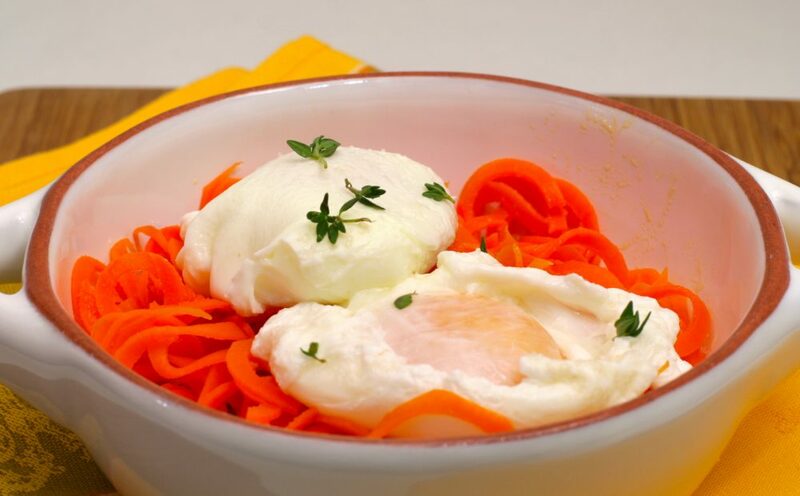 *Spiralizing carrots works best with large fat carrots. This recipe would be great on spiralized zucchini, too.